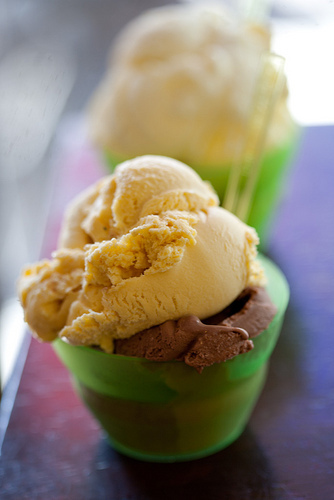 Foodista | Celebrate Ice Cream Days at the Ice Cream Capital of the World! Each year in Le Mars, Iowa, there is a four day festival to celebrate their status as the Ice Cream Capital of the World! Beginning to day and lasting through the weekend, celebrate the 25th Annual Ice Cream Days festival with the city that brought you Blue Bunny Brand Ice Cream, since 1913. With fun family events like arts and crafts, a carnival and parade to competitions (R/C Airplane and Helicopter flying contests, a Create Your Own Flavor competition and Fly Fishing) and so much more, the four-day event is also geared towards cultural heritage with a genealogical advisor, several silent auctions featuring historical content and, of course, no fewer than 3 ice cream socials! So grab the kids and get a move-on because this fun-filled-family event is sure to melt away over the weekend.